One can create Parent / Child (A.K.A. Master / Detail) relationships in SharePoint 2007 by using lookups to reference a parent list from a child list. I will discuss another way of creating a Parent / Child relationship by adding a content type inside a folder. 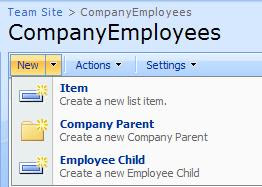 The strategy will be to make the "Company Parent" entity a folder which contains "Employee Child" items. To accomplish this we will create two new content types for each entity. 3) Click on "Add from new site column" on the "Site Content Type: …" page under column. NOTE: We will reuse the "Title" field to be the CompanyName. 4) Click on "Add from new site column" on the "Site Content Type: …" page under column. • Column name: Branch of type "Single line of text"
NOTE: We will reuse the "Title" field to be the EmployeeName. Now we can go about our normal business of creating a custom list and using our two newly created content types "Company Parent" and "Employee Child". 2) Click on "Custom List" under the "Custom Lists" column. 5) At the very top, change Allow management of content types?" to Yes. 7) Under "Content Types" click on "Add from existing site content types". • Add "Company Parent" and "Employee Child" content types. Let’s add some dummy data. 5. Add bogus company employees to "ACME Corporation"
• Click on "ACME Corporation". This causes the folder to open. • Click on "Bogus Enterprises". This causes the folder to open. This concludes configuration and data entry. Let us now use the SharePoint 2007 Object Model to get at this data. Hi, this was exactly what I was looking for and it is working just fine. 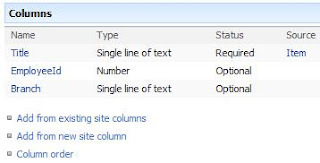 The only I need help with is on how to use the SharePoint 2007 Object Model to get at this data. What is this? Where do I add it (sharepoint designer, webpart, ...)? Can you please provide some more information on this?